OldTownNewhall.com | Hart of the West Powwow 2000: Head Dancers Nancy Garcia, Efrain Zazueta Jr.
Head man, woman dancers selected for Hart of the West Powwow 2000 on Sept. 23-24. One is a correctional officer at a federal prison in Victorville. The other is in retail sales in the San Fernando Valley. Next weekend they will be leaving their 9-to-5 jobs behind, donning authentic Native American costumes and leading the male and female dancers, respectively, into the arena. It is the first time either has performed head-dancer duties at a powwow. "It is a real honor to be asked," said Efrain Zazueta Jr., aka "E.Z.," an Arizona transplant who traces his lineage to the Yaqui, Tarahumara and Aztecía tribes. Head man dancer at the Sept. 23-24 powwow at Hart Park, Zazueta has "been around the powwow circuit for about six years," dancing in the Southern Straight style of the southern plains Indians. His female counterpart, Nancy Garcia, of Cherokee descent, also has performed at powwows for the past half-dozen years, dancing in Southern Traditional Cloth style. "The tradition is, no other woman should go into the arena before me," said Garcia, explaining her role as head woman dancer at this year's powwow. "It brings new life to the powwow" to have new head dancers each year, said Marylina Schultz, chairwoman of Hart of the West. The selection of head dancers was not a decision made lightly. "We try to get someone with good character who is active in the powwow and has a good following," Schultz said, adding that Garcia and Zazueta are "very nice" people who fit the bill. While both are recognized for the dancing skill, the paths that led them into the arena are quite diverse. 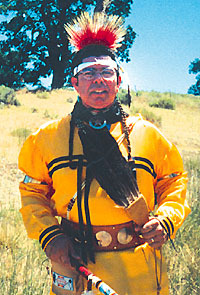 "I have been going to powwows since the 1970s when I was in Oklahoma. Coming out to California, there were not many powwows when I came here," said Zazueta, who lives near Edwards Air Force Base. Zazueta met the elder, Pete Many Horse Mares, a prominent Southern Straight dancer, who taught him the art. From the Juaneño (Acjachemem) band of Mission Indians in San Luis Obispo, the elder also got Zazueta's children involved: Efrain III is a grass dancer, a northern style, while daughters Teresa and Nalin dance Southern Traditional Cloth. "A father can teach his children, but usually is it an uncle or an elder," Zazueta said. Garcia, in contrast, "learned (to dance) just from watching." "Growing up, I've always known of my Cherokee heritage," she said. "My mother told me of it. I've always been proud of it." "I saw a commercial on TV advertising a powwow. I attended and I was hooked," she said. That was seven years and innumerable powwows ago. "I try to go to a powwow every weekend," Garcia said. The drum beat for a southern dance, she said, is slower than the northern. "Southern women plant their foot solidly and have a dip at their knees," she said. "Northern women — I've seen some stay up on their toes." 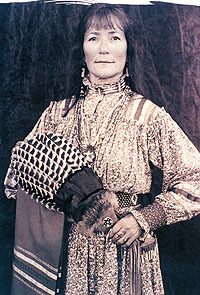 During the heavier "honor" beat, she said, "northern women will do something to show respect, they will raise their fans. Southern women bow from the waist and do different footsteps. That's how you can tell the difference — if you see them fanning the air or bowing at the waist to honor the drummer." "Southern tribal cloth is patterned after what the women wear," said Zazueta. "It's similar to buckskin but without the fringe." Southern dancers don't have the feathered bussel down the back that others have, he said. Spectators are likely to see a variety of costumes and footsteps during each intertribal dance. "Different dance groups participate (at the same time)," said Garcia. "Some do southern, some do northern dances, depending on the area they're from." Dancing may be the biggest way Garcia and Zazueta express their heritage, but it is not the only way. Garcia enjoys doing Native American handicrafts and attends Sweat Lodges "whenever I can," while Zazueta facilitates Sweat Lodges for Native American inmates at the Federal Correctional Complex in Victorville and other state and federal prisons, and coordinates the Lodge Circle Ministries at Calvary Chapel of North Edwards. "As an elder once explained to me," Zazueta said, "we attend church because we believe in God. We participate in ceremonies and powwows because we're Indian."